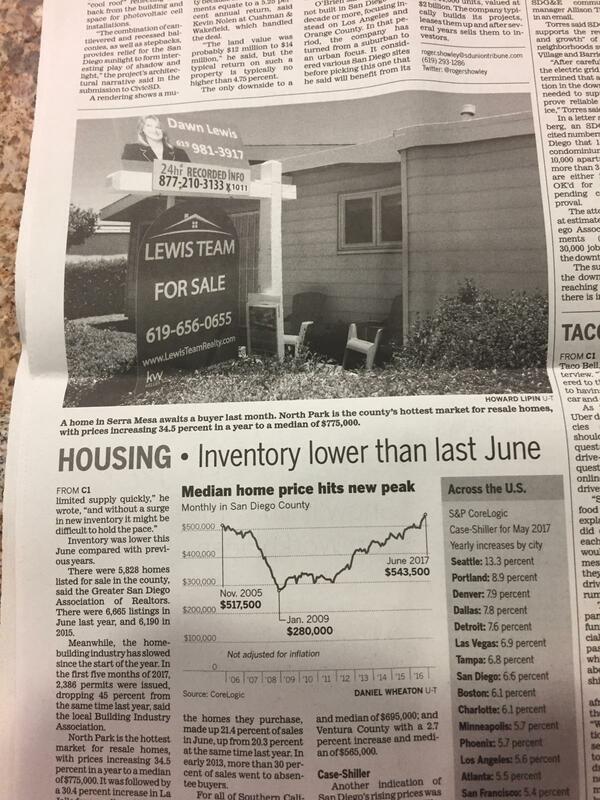 While reading the San Diego Union Tribune we were pleasantly surprised to see a picture of our “Lewis Team” real estate sign with the “Dawn Lewis” rider on one of our San Diego Listings in Serra Mesa. Love the free marketing from a paper that has a huge audience of readers. Thanks Union Tribune. This article was in the San Diego Real Estate Section of the UT. The San Diego real estate market has been doing well in San Diego and has been on the rise since 2011 in most areas of the county. The median home price of a home in San Diego County has hit a high of $543,500 according to the UT and CoreLogic. The UT also reported the low inventory of homes and condos throughout San Diego County which has been a problem for home buyers in San Diego. Home sellers, in most areas of San Diego County in high demand price ranges, have been receiving multiple offers on their properties. Bidding wars have been common and appraisal issues have also arisen from the over bidding. If you’re considering selling your home in San Diego County then please contact Mike and Dawn Lewis at The Lewis Team to get a FREE San Diego Home Value Check. If you need help buying or selling real estate in San Diego County give us a call.